A garden trowel is a tool having a curved blade, which is mainly used for lifting plants and digging small holes. This multipurpose tool can also be used for planting, soil leveling, potting, and soil preparation. This tool is extensively used in various gardening activities, hence considered an essential part of the gardening tools collection. The trowel, in general, is also used in constructional activities like shaping and smoothing a mold, cement, or mortar. But, these trowels, unlike the garden trowels, have a flat blade and they also differ in design. Anyway, garden trowel is the most widely used type of trowel. The blade of garden trowel is mostly made of carbon steel, metal, or polymer, which makes it durable and long lasting. 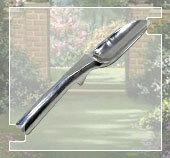 Garden trowels come in several varieties, depending upon the type of application. Two varieties are more significant among them, i.e., the weeding trowel and the dandelion trowel. The weeding trowel is best fitted for application areas where one has to work in the cracks between pavements, and so; while the dandelion trowel is ideal for pulling out deep rooted weeds.